When it comes to decorating rooms I normally get an idea in my head of exactly what I want. However finding what I want is easier said than done. So when I read that there was a competition with order blinds CollectivEdge to design your own print I was so excited. If I'm lucky enough to win I will win a blind with my design on and it will also be featured on their website. So my idea for the blind came to me straight away as the design has to be for a children's room. Brilliant!! as we will be decorating Eryn-Rose's bedroom this year. I have planned the whole room and after hours of searching found the wallpaper that I wanted. Ok not exactly how I wanted but it will suffice. Having found the wallpaper and planned the colours I was stuck in finding curtains or blinds that would match. The only ones I could find were just a plain colour and that is not what I want. I'm Van Gough. I can draw pretty well but my drawing style is normally anime so this was out of my comfort zone. As you may be able to tell my daughters room will be a Woodland theme. I was always brought up around the beauty of woodlands and nature, as we live in a town with the view of a big power plant I want to create a lovely bedroom where she can feel like a fairy princess roaming through enchanted woodlands. I chose animals that you would normally come across in the woods. 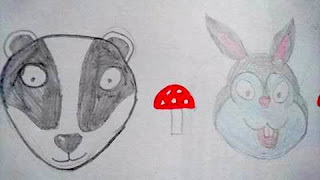 Here we have a Badger and a Bunny the toad-stalls were just to break it up a bit and add that magically element. Most fairy tales contain a toad-stall. 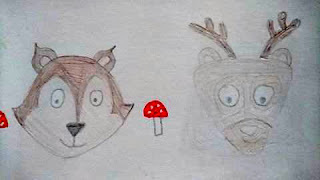 I then originally planned to draw a fox but somehow created a squirrel who I actually prefer and think is rather cute (even if the face is wonky) then we have a Deer who I have really struggled to draw, the antlers were the easy bit the rest was rubbed out and re-drawn several times. I settled with this hopefully if I'm lucky enough to win the artist who re creates my design is a lot better at drawing Deer's. 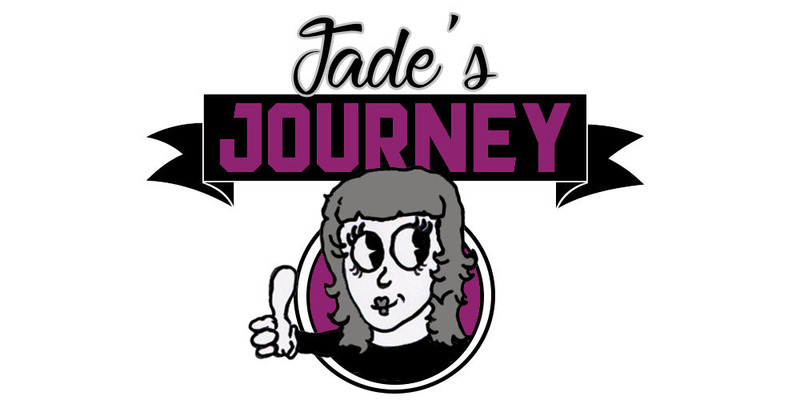 So that is my design and my entry if you have also entered I would love to see your design.